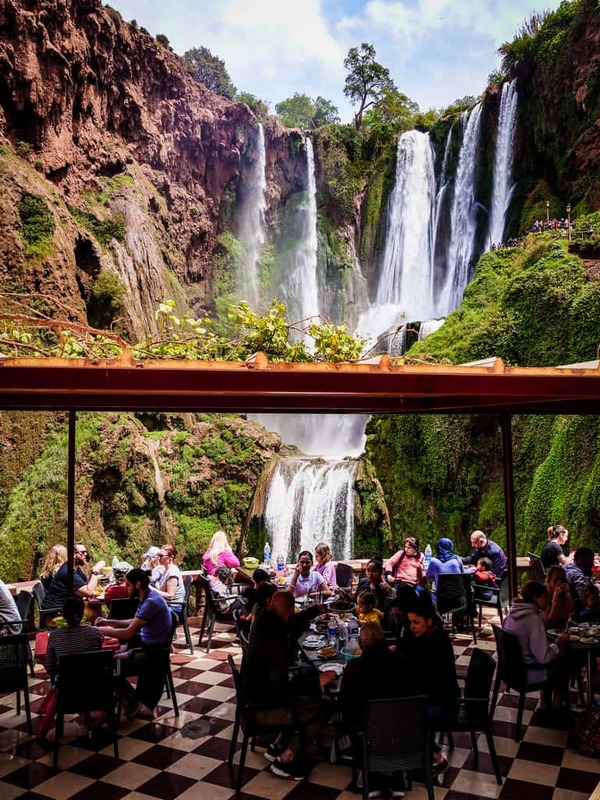 This article explains how to get to the Ouzoud waterfalls from Marrakesh independently (by public transport or with your own car) or with a tour. 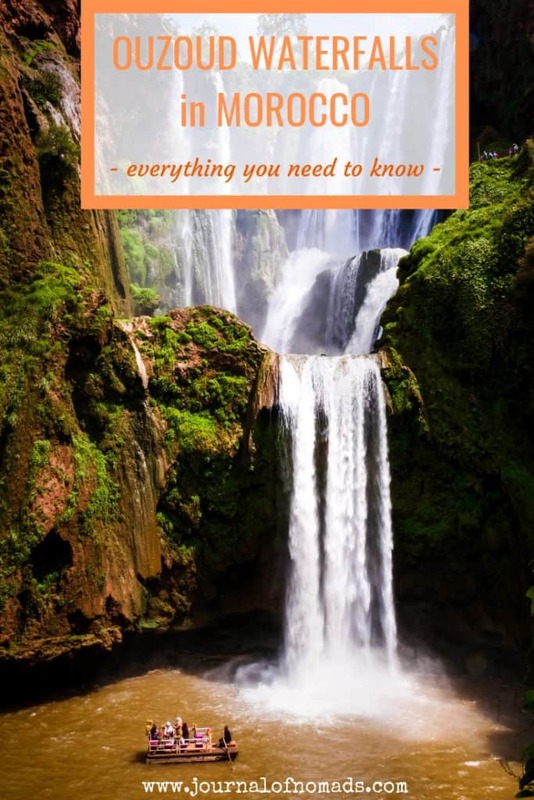 It also explains how to hike the trail around the Ouzoud waterfalls and what you need to bring on this trip. A lot of people imagine Morocco to be a vast barren desert. Before I came here I also thought that finding lush forests and waterfalls in this country would be nearly impossible. It’s true that the southern part of the country is quite arid. 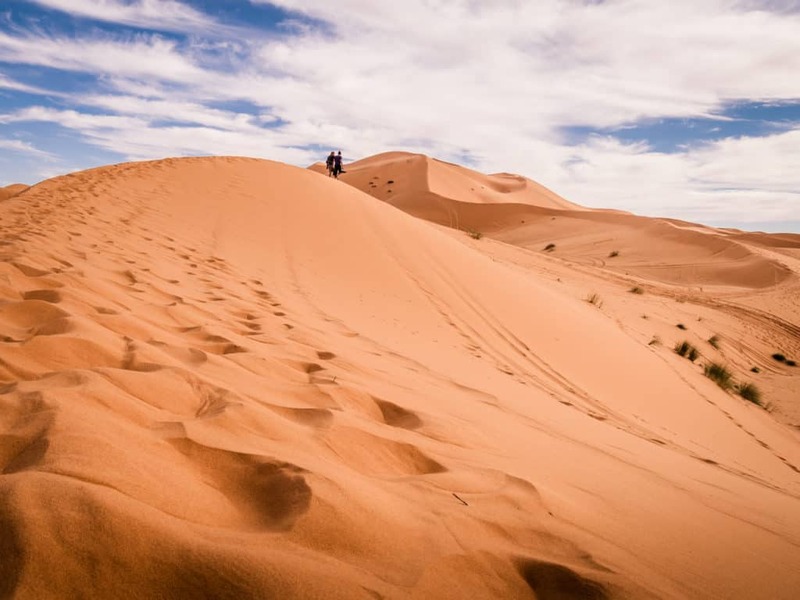 There are beautiful sand dunes in Merzouga and the canyons near the Todra gorges are really fun to explore. The northern part of the country, however, is much lusher than I had initially imagined it to be. 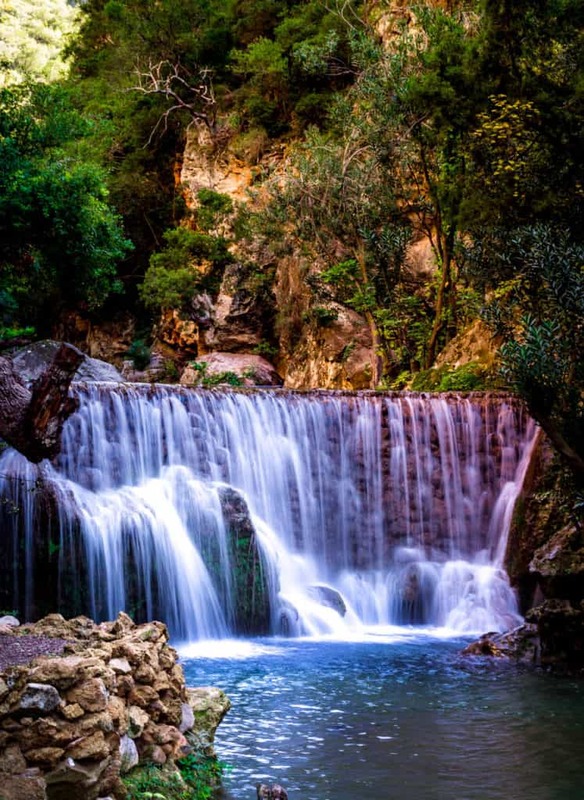 The whole area near Chefchaouen is full of green forests and it’s also a place where one can visit the lovely Akchour waterfalls. A few weeks ago Cynthia and I were in Marrakesh and we heard about the Ouzoud waterfalls and realized we absolutely had to visit them. 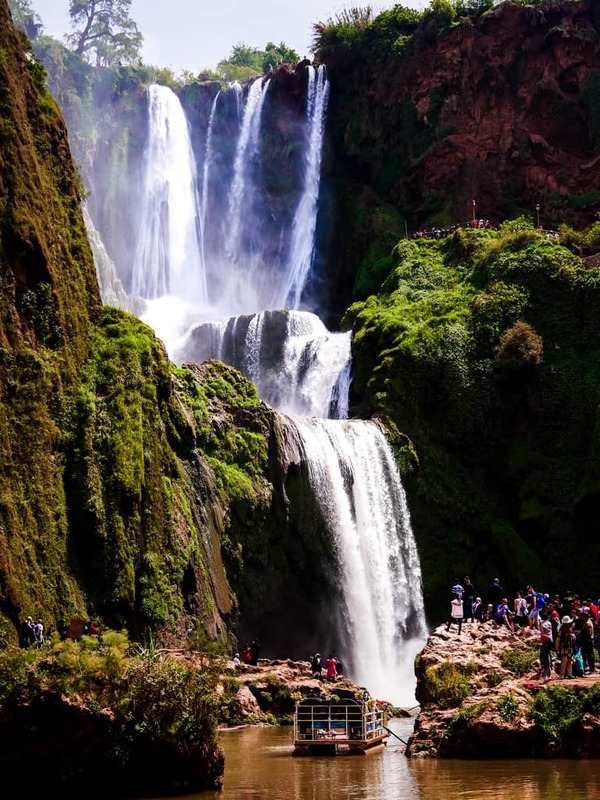 Together with Imlil, the Ouzoud waterfalls are the perfect day trip from Marrakesh. 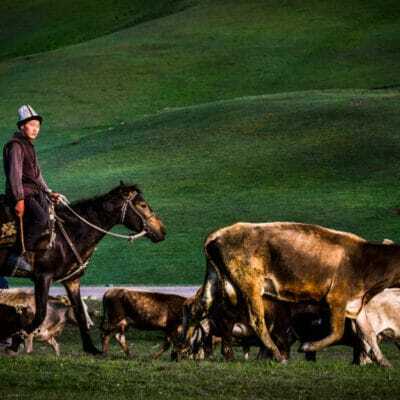 The city was becoming overwhelmingly busy and we needed to take a trip to the countryside to get away from the crowds for a while. We thought the waterfalls would be a quiet place to enjoy nature but we couldn’t have been more wrong. The Ouzoud Waterfalls is the second tallest waterfall in Africa. It’s a huge touristic destination and one of the most visited and photographed natural sites in Morocco! 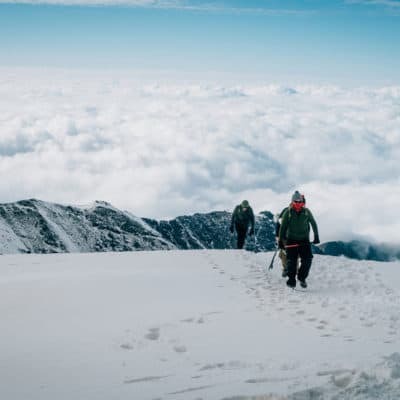 So I’d like to start this article with a warning: do not expect to be alone there and do not expect these waterfalls to be as quiet as the Akchour waterfalls near Chefchaouen. We started looking online to find information on How to get to the Ouzoud waterfalls by public transport. What we found out is that first, we’d need to take a shared taxi from Marrakesh to a small town called Azilal and from there another one to Ouzoud. We’d have to get back to Marrakesh the same way by waiting for the shared taxis to fill up and then head back. Getting there from Marrakesh and back by public transport would cost around 300 MAD per person. It would also eat up a large chunk of our day. When we found out that we could go there with a tour for 500 MAD (for two), we decided to go with this option instead. 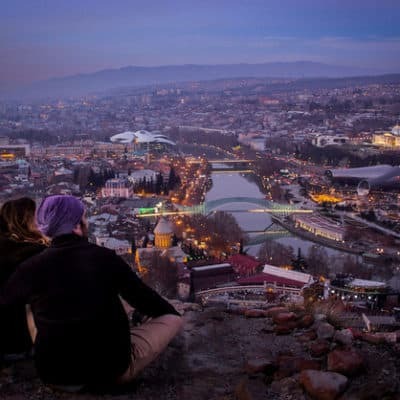 We’d be going there directly and wouldn’t waste time hopping from one transport to another. I also asked the tour operator if we could walk around the Ouzoud waterfalls independently and if there wouldn’t be any hidden costs (see scams in Morocco). Our tour operator told us that we would be totally free to visit the waterfalls but when we arrived there, we quickly realized it wasn’t the case. A guide was waiting for our group far away from the official entrance of the site. He went on saying that it was impossible to visit the waterfalls independently and that each member of the group would have to pay him 3 euros at the end of the tour for his services. The driver of our van was on the scam with him as he had dropped us off far from the entrance. Because I spent a lot of time in Morocco and I learned Moroccan Arabic, I was well aware of what was going on. Cynthia and I managed to leave the group and we explored the area around the falls by ourselves. In this article, I’ll tell you how to avoid this scam. I’ll also explain how to visit the Ouzoud waterfalls independently by public transport, as part of a tour group or with your own car. I will also tell you exactly what you should expect from a trip to the Ouzoud waterfalls and what you should bring there. 1.1 Can you visit the waterfalls independently and do you absolutely need a guide? 1.2 Is it safe to visit the Ouzoud waterfalls? 1.3 What’s the best time of the year to visit the Ouzoud waterfalls? 1.4 How much does it cost to visit the Ouzoud waterfalls? 1.5 Do Moroccans speak English at the Ouzoud waterfalls? 3.1 How much is an organized tour to the Ouzoud waterfalls? 3.2 What should you expect from an organized tour to the Ouzoud waterfalls? 3.3 Is it worth taking an organized tour to the Ouzoud waterfalls? 4. What can you do around the Ouzoud waterfalls? 6. What’s the best viewpoint to take pictures of the Ouzoud waterfalls? 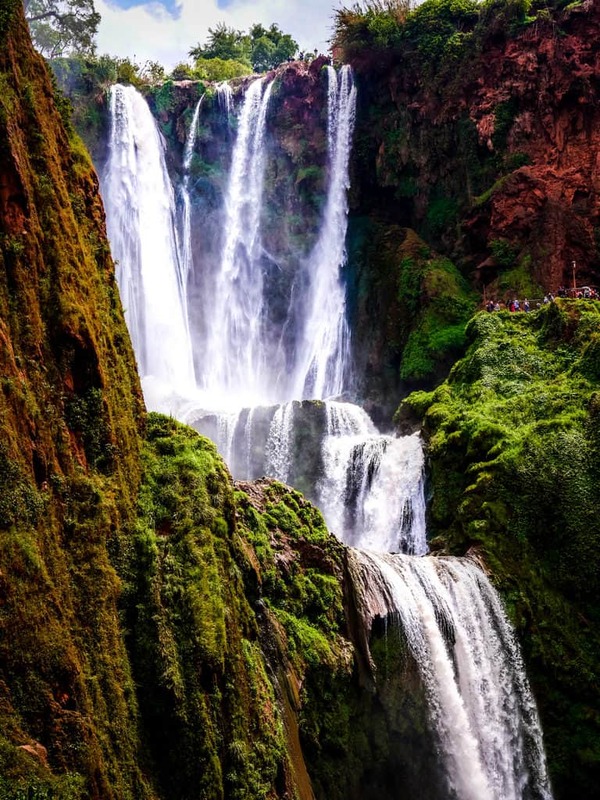 There is no need for a guide to visit the Ouzoud waterfalls. There is only one path that takes you from the top of the cascades to the bottom and vice-versa. If you visit these cascades with a tour group from Marrakesh, there might be a local guide already included in the final price. I would suggest verifying this with the tour operator that you buy the trip from beforehand to avoid being scammed. The waterfalls are very easy to visit alone and I would advise doing so if you don’t want to have to follow a group for hours. The paths are easy to follow and do not require the assistance of someone to show you the way. From the entrance of the site, take the left path downhill. It will take you down a cemented little road which is lined with small shops and restaurants. From there you can continue all the way to the bottom of the waterfall where you’ll find a few cafes and if you’re lucky, some Berber monkeys. The waterfalls are relatively safe to visit. The path is well marked and it’s almost impossible to get lost. A few parts that overlook the waterfalls, however, could be dangerous, especially near the top of the great cascade not too far from the entrance of the site. The falls are very high (about 110-meter) so I would advise treading on the paths and the cliffs that surround them with caution. I’m sometimes a bit scared of heights myself and wouldn’t lean too close to the edge of the falls. While I was there I couldn’t help but notice teenagers taking the most dangerous selfies ever while leaning above the 110-meter drop! Be careful while visiting the Ouzoud waterfalls and avoid getting too close to the edge of the rocks overlooking the tallest cascade. The Ouzoud cascades can be visited the whole year round. It’s much busier during summer but that’s the best time of the year to go if you want to swim in the pools at the bottom of the falls. There is more water during winter and usually a lot fewer tourists, so if you don’t mind that it’s too cold to swim, winter is probably the best time to visit the Ouzoud waterfalls. There is no entrance fee for the Ouzoud waterfalls but if you want, you could always hire a local guide to show you around (although it’s absolutely not needed). A guide will charge around 30 MAD per person if you are visiting with a group of friends or 100 to 150 MAD if you are alone. 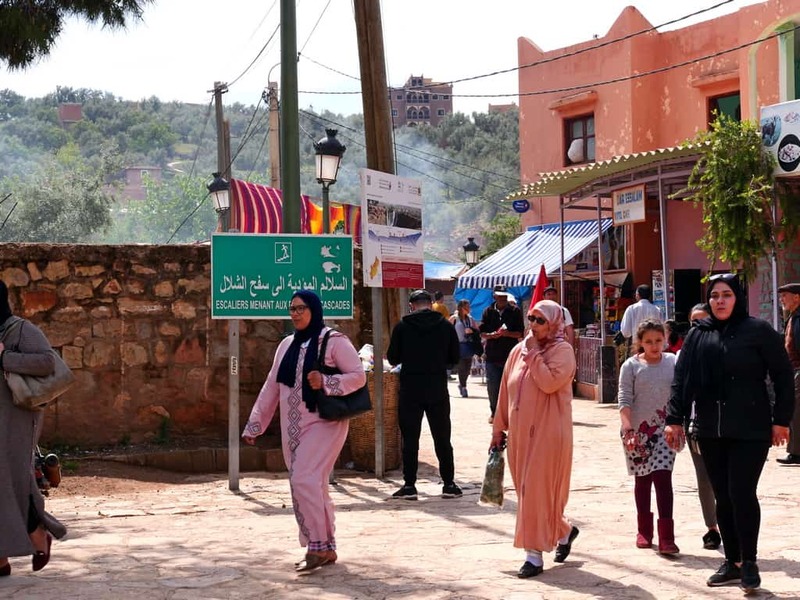 A quick tip: The restaurants near the waterfalls are not very expensive but if you want to travel around Morocco on a budget, I would suggest bringing some snacks with you. Almost all the guides and the shop owners at the Ouzoud waterfall speak a bit of English. There is no need to worry about them not understanding you or vice versa. 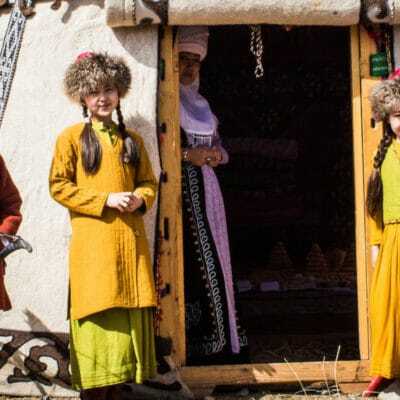 However, a big part of the population still speaks only Arabic and Berber. Learning a few words or expressions in those languages before visiting the Ouzoud waterfalls will definitely be helpful. If learning languages is not your thing, I would recommend getting your hands on the Lonely Planet Moroccan Arabic phrasebook and dictionary. It’s packed with thousands of sentences that will help you in different situations and scenarios. 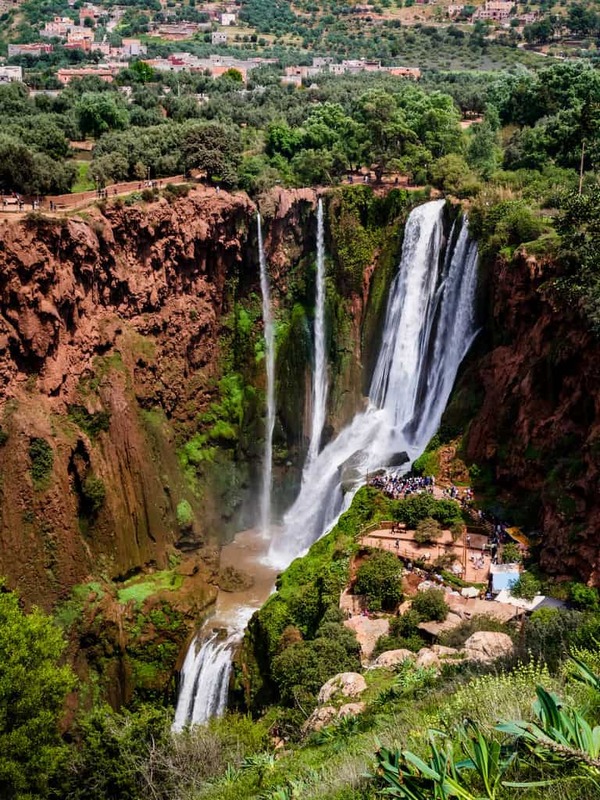 The Ouzoud waterfalls are located 157 km from Marrakesh and it takes about two hours and a half to get there by car. If you have your own car or if you are renting one, you will totally enjoy the drive there. As you leave Marrakesh and approach the area around Ouzoud, the landscapes will completely change. 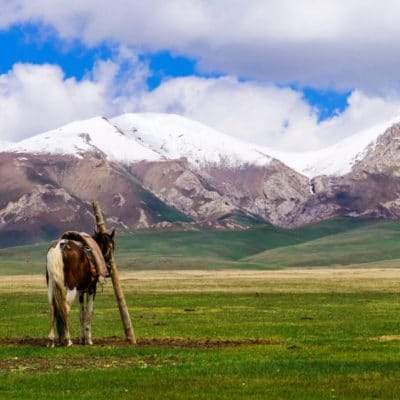 You will go from a very flat landscape to a much more mountainous terrain. The temperature will also become a lot cooler and the hills will seemingly become covered with more and more trees as you approach the falls. To get from Marrakesh to Ouzoud, you will have to drive towards the northeast on highway N8 until you reach highway R208. Once you reach the R208 continue towards the village of Tanant and from there to Ouzoud. I would advise driving with caution as you approach Ouzoud. There are a lot of kids that play on the roads in the villages near the cascades. On the way there we also saw a lot of children and teenagers that were selling fruits and nuts on the side of the highway. They can sometimes jump out into the road without notice so drive carefully. If you have your own car or if you are renting one, it will be much more practical to park it directly at the entrance of the site rather than far away. There are a lot of places where you can park your car near the cascades but it will cost between 10 and 20 MAD to park your car there for the day. You can pay that small fee directly to the parking attendant. 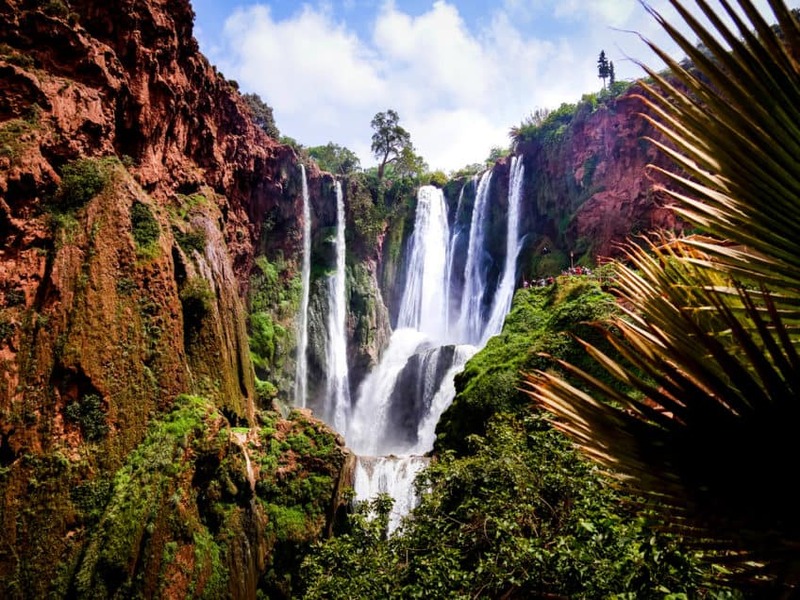 Where can you rent a car in Marrakesh to visit the Ouzoud waterfalls? Instead of wasting tons of time from your day to try to find a good car rental agency in Marrakesh, you could rent a car here. Renting a car in Morocco is relatively easy if you go to the right place straight from the start. Before you rent a car in Morocco, I would strongly advise you read this excellent guide full of practical information. Don’t know what to bring to Morocco? There are a few different ways to reach the Ouzoud waterfalls by public transportation. You could take a shared taxi from Marrakesh to Azilal and then another one to Ouzoud. 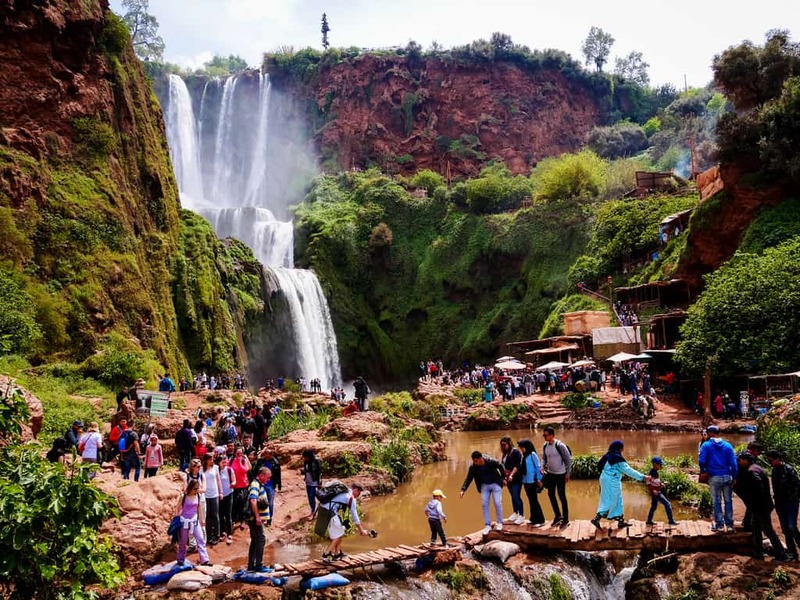 You could also take a shared taxi or a bus very early to the city of Beni-Mellal and then take a shared taxi to the waterfalls from there. 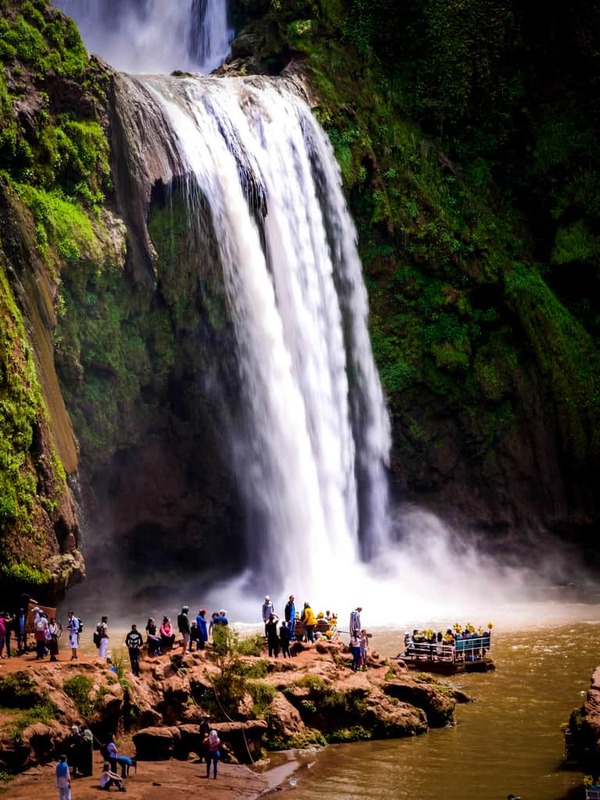 A good option to reach the Ouzoud waterfalls is to take a shared taxi from Marrakesh. You can take a shared taxi from Bab Doukala and it will get you to a village called Azilal not too far from the falls. This is the location of Bab Doukala in Marrakesh. A shared taxi from there to Azilal should cost around 50 MAD per person if the taxi is full (6 people) when you leave. Some taxi drivers don’t like to wait until the taxi fills up before they leave so you may have to pay a bit more. If you don’t want to wait for the taxi to fill up, you could also pay for the remaining seats to leave even earlier. From Marrakesh, the shared taxi will bring you to Azilal. This is a small town not far from the waterfalls from where you’ll have to take a second shared taxi. The taxis from Azilal to Ouzoud are a bit cheaper (about 25 MAD per person) and once again you could pay for the whole taxi to get to the cascades faster. If you’d pay for a whole taxi from Azilal to Ouzoud, it would cost around 150 MAD. 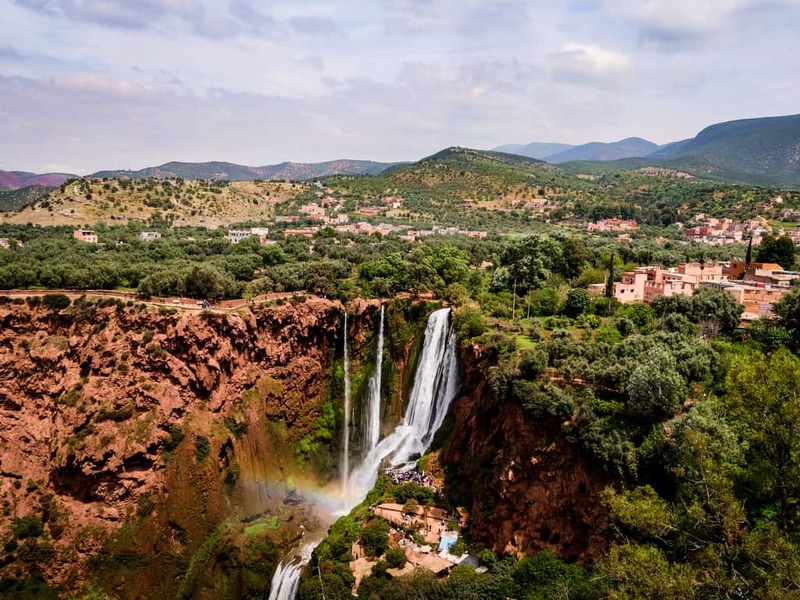 Another option to reach the Ouzoud cascades is to take a bus from Marrakesh to Beni-Mellal and then to take a shared taxi from there to the waterfalls. This option, however, is the one that takes the biggest amount of time and it also costs a lot more. 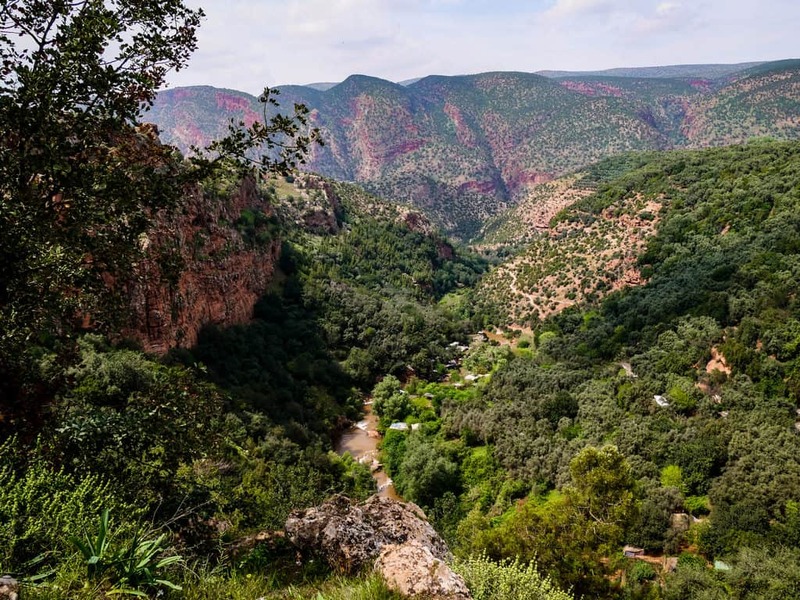 I would only advise this option if you are interested in combining your visit of Ouzoud with a visit of Beni-Mellal and make it into a two-day trip. 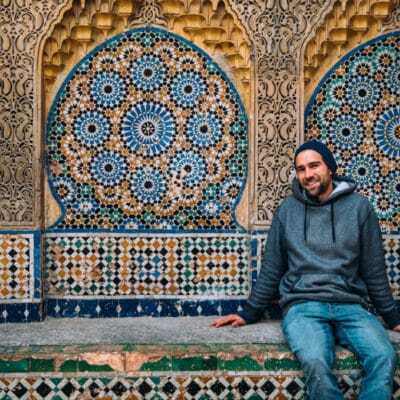 You can take a bus from Marrakesh to Beni-Mellal with the two main bus companies in Morocco, CTM, and Supratours or with a local bus at the central bus station of Marrakesh. 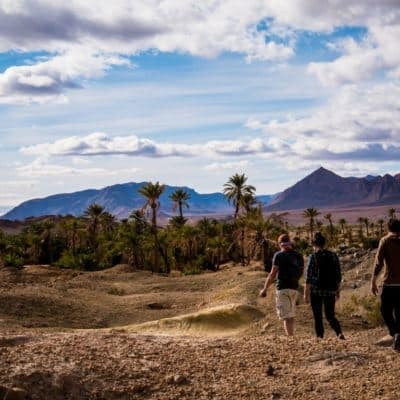 Hitchhiking in Morocco is very easy and super fun. Most people who stop are super friendly and might want to invite you to their homes or to the restaurant for a meal. 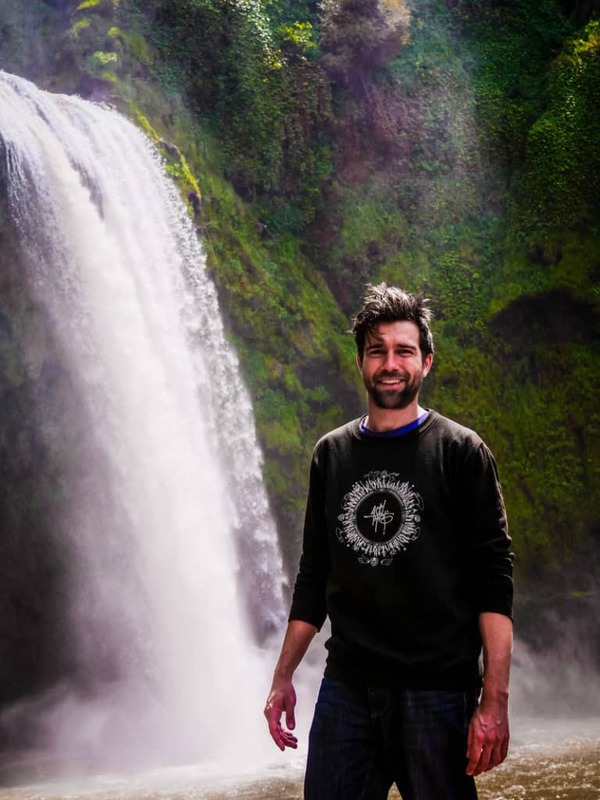 I would consider hitchhiking to the Ouzoud waterfalls a good option but you should try to start as early as possible in Marrakesh. You’ll also have to find the exit to highway N28 that goes towards Beni-Mellal. 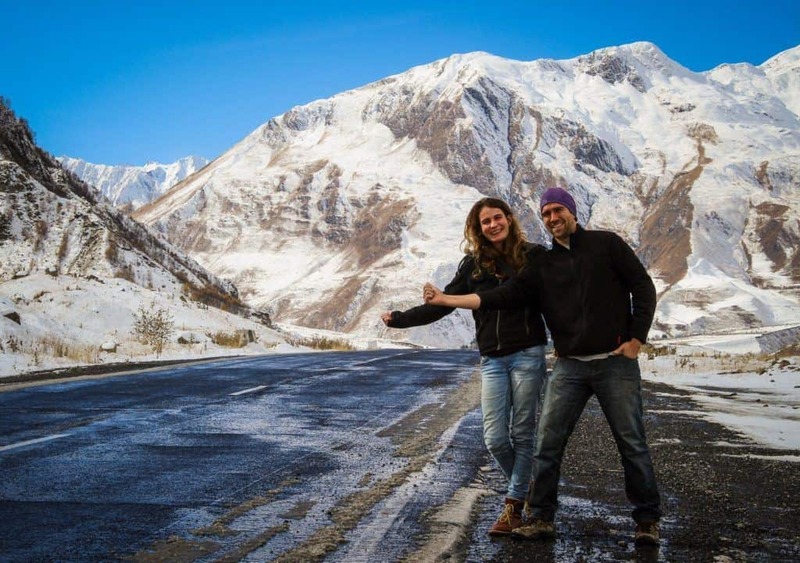 Hitchhiking from Marrakesh to the Ouzoud waterfalls could end up taking more than a day because there isn’t much traffic on the highways linking the two cities. Bring a good tent if you want to camp in the gorgeous mountains along the way. 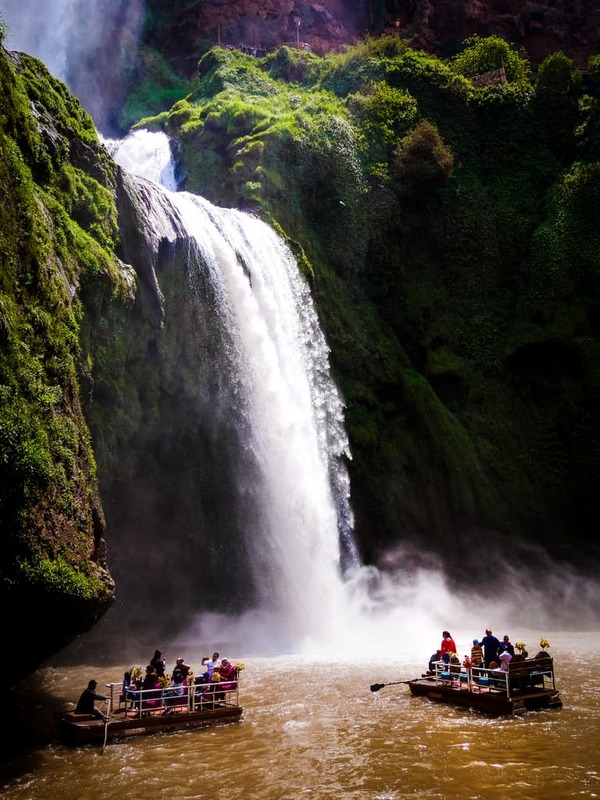 Being part of a tour group is probably the most popular way to reach the Ouzoud waterfalls from Marrakesh. A lot of different companies in Marrakesh offer tours to the cascades and their prices tend to vary a lot. The price for organized tours to the Ouzoud waterfalls starts around 275 MAD per person. This includes the ride to the waterfalls and back in a comfortable minivan but it doesn’t include the price of the local guide or food near the cascades. You can book such a tour in restaurants and cafes all around Jemaa el Fna square in Marrakesh. If you would like to book your tour ahead of time, you could book it online through Get your Guide. If you reserve it through this link, we’ll receive a small commission at no extra costs for you. This way you’re helping us writing more informative and awesome guides like this. 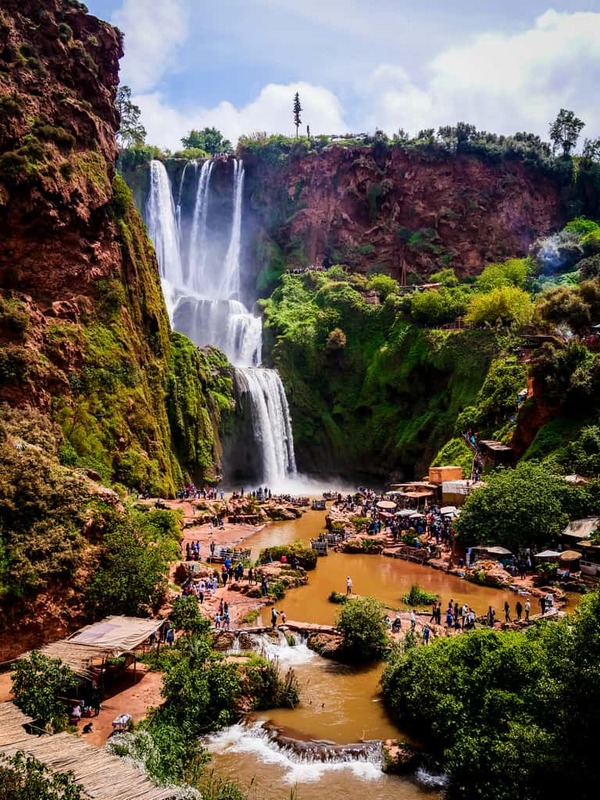 If you book a tour to the Ouzoud waterfalls, you’ll save a lot of time that you would have otherwise spent in finding public transport to get there. You can expect a smooth ride in a very comfortable air-conditioned minibus and a few stops for refreshments along the way. The pick-up will be directly at your hostel or hotel in Marrakesh or at the Jemaa el Fna square in the morning. Most tours will provide you with an English or French-speaking driver. Some tours will include a local guide at the falls in their price while others won’t. 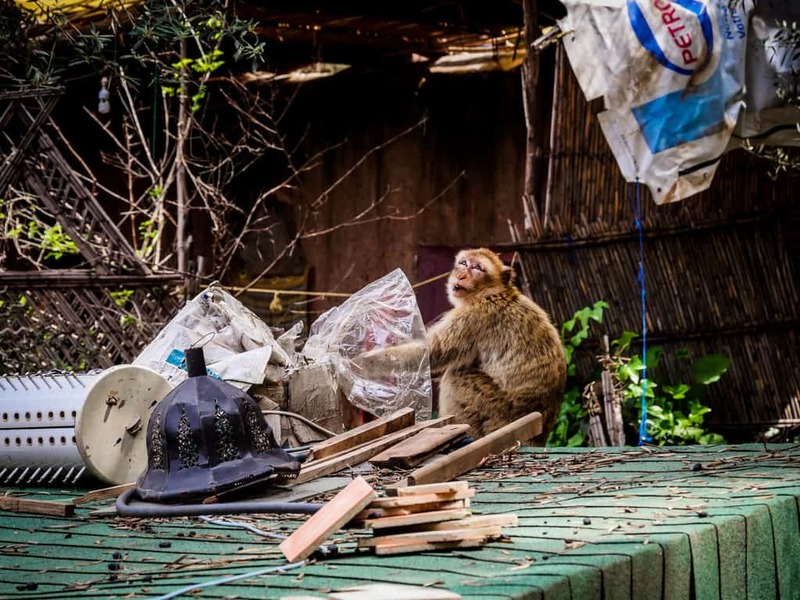 You should discuss this beforehand with your tour operator. The tour that we offer through Get your Guide already includes the fare for the local guide. The tours do not include lunch so you should either bring snacks or have money for the restaurants near the falls. Although the paths in Ouzoud are very easy to walk on, we suggest bringing a good pair of walking shoes or some sandals. Also, bring some sunscreen and don’t forget your camera. 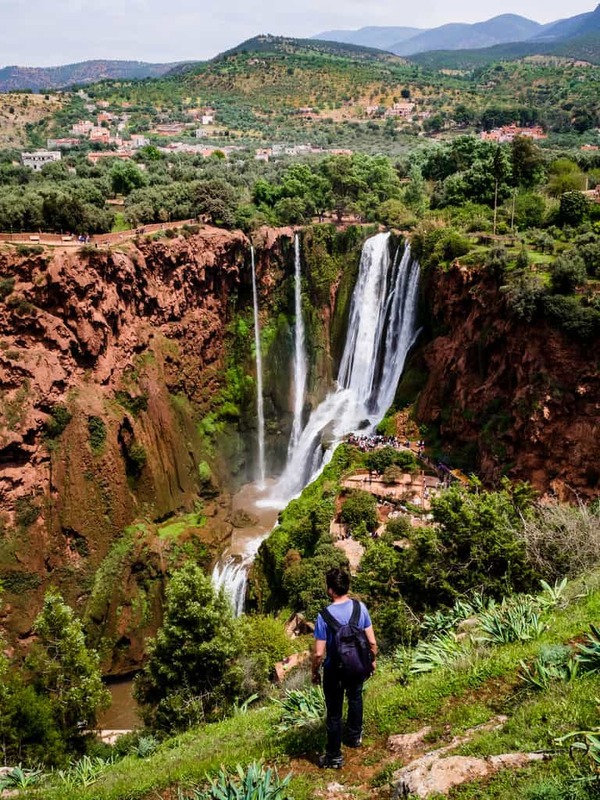 Do you want to see other waterfalls in Morocco? 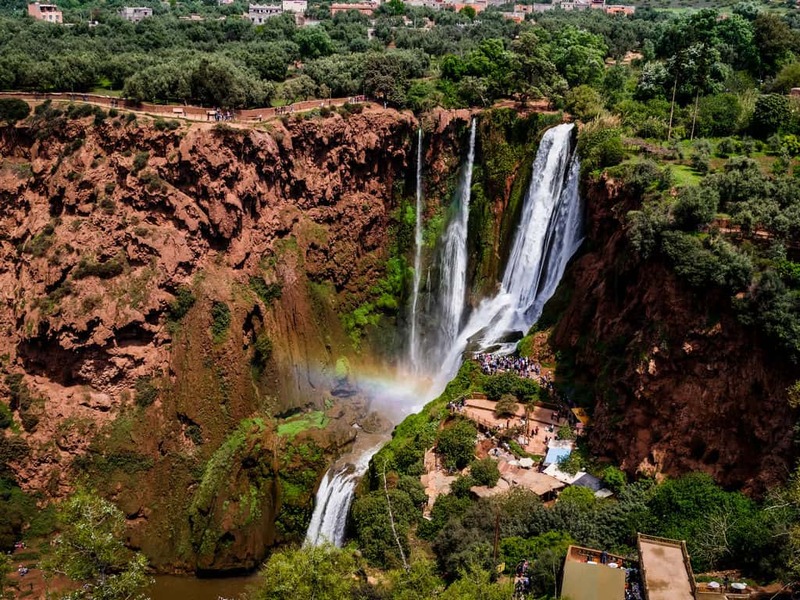 Taking a tour to the Ouzoud waterfalls is worth it as you’ll save a lot of time waiting for shared taxis and navigating your way there with public transport. You’ll also be able to spend more time visiting the actual site and enjoying the waters of the Al Abid river. The only downside is that you might feel like a sheep, squeezed in between all the members of your tour and you’ll have to follow a guide during the whole visit. If you already have your own car or if you are renting one, I would much more recommend driving there by yourself than going on a tour. Reaching the site is really easy and not complicated at all and you’ll be able to visit the falls at your own rhythm and stay there longer if you wish. Depending on the time of the year that you visit the waterfalls, you’ll be able to do some additional activities. If you visit Ouzoud during the summer, the water of the Al abid river will be warm enough to swim in it. There are different pools where one can swim right at the bottom of the Ouzoud waterfalls. If the current is not too strong, it’s possible to go a bit farther from the falls and swim in a calmer part of the river away from the crowds. There are small boats on the first pool of water at the bottom of the falls. For a small fee (about 20 MAD) they can take you very close to the cascades. If you go on that boat ride, be prepared to get wet. I would suggest bringing a rain jacket and a water-resistant camera to enjoy the experience to the fullest. 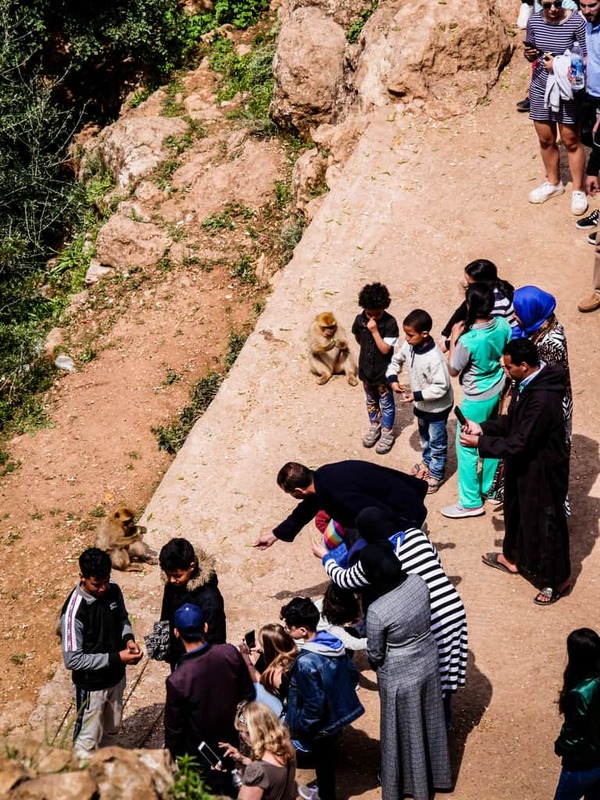 One of the main reasons so many people visit this site apart from the beautiful waterfalls is the presence of wild Barbary monkeys. They play in the trees and hang out all around the river and the cascades. Although they are wild, most of them will come closer in a very peaceful manner if you offer them food. Bring some nuts and fruits on your trip to the Ouzoud waterfalls and you’ll surely make new friends! The best way to avoid the crowds is to visit the area during winter. There are much fewer tourists there at that time of the year. It’s also better to visit the falls as early as possible during the day since the place starts becoming really busy around noon. What could be a good way to have the falls all for yourself is to bring a good tent and camp at one of the campsites near Ouzoud. That way, you can wake up and explore the area first thing in the morning. Not only will you avoid the crowds but you’ll also have a much better light to take awesome pictures. There are a lot of excellent viewpoints at the Ouzoud waterfalls where you’ll get some pretty amazing pictures. If you want to take a picture of the waterfalls that will capture the vastness of the site however, there is a particular picture spot that I would recommend. 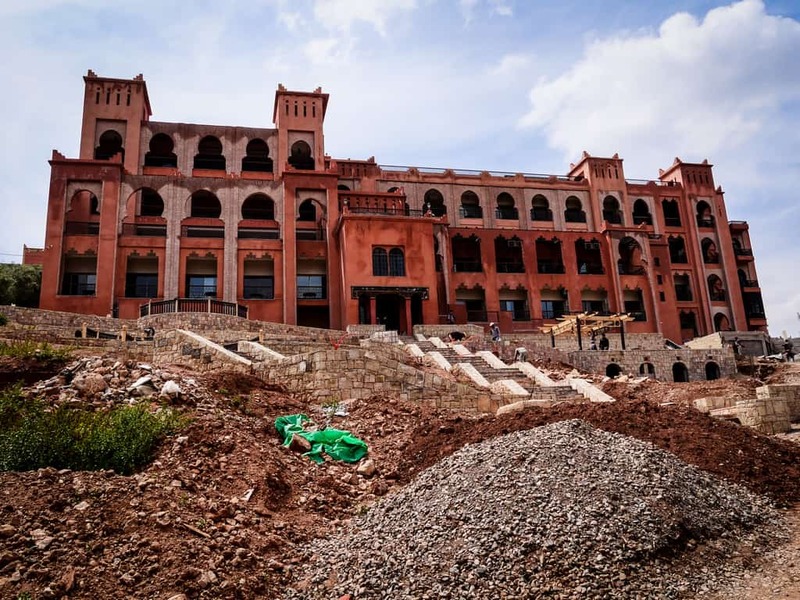 It’s next to a huge hotel overlooking the waterfalls that is being built as I’m writing the article. I don’t know exactly how the hotel is called but here’s a photo so you know where to go to get the best pictures of the cascades. I hope you have an awesome time at the Ouzoud waterfalls and that you enjoy the area whether you visit the site independently or with a tour company. Let us know how your trip went by contacting us or by leaving us a comment down below.